As was to be expected my glider bag didn't arrive with me when I finally made it to Macedonia. So I spent Saturday watching people having fun in beautiful skies (picture). 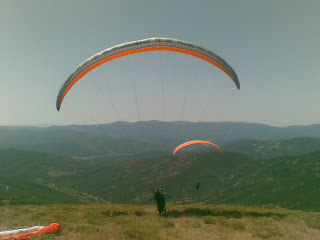 Luckily my glider did find its way here to Krusevo last night so today I could practice. The Swedes designed a nice 65 km task with legs along the mountain range as well as an out- and return leg over the flats. After 4 hours of very nice flying I arrived in the goal, apparently as the 15th or so pilot. Tonight we complete the registration and have the opening party and then we're more than ready for the Nordic Open 2008!